The Toyota Cheetahs and Isuzu Southern Kings went down fighting on Sunday against Irish Guinness PRO14 giants, Munster and Leinster respectively, as both teams suffered narrow defeats at home despite playing some courageous rugby.The Toyota Cheetahs lost by 30-26 defeat against Munster in Bloemfontein, while the Isuzu Southern Kings went down 38-31 against Leinster in Port Elizabeth. 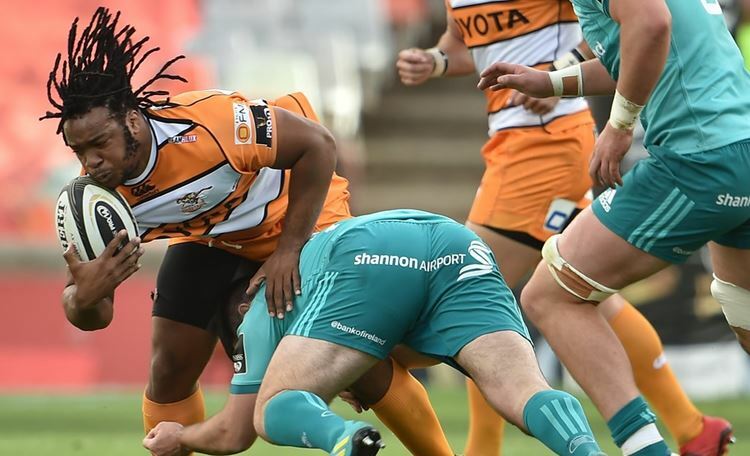 A knock-on by the Toyota Cheetahs metres from the visitors’ tryline in the dying moments of the match at the Toyota Stadium denied them a chance to register back-to-back victories in the competition. Both teams scored four tries, but two penalty goals and two conversions by Munster to only three conversions by the hosts proved to be the difference on the scoreboard in the end.The first 36 minutes of the match was closely contested, with Munster leading 8-5 despite losing Chris Cloete for 10 minutes to a yellow card. But the visitors powered their way over the tryline for the second time after a break-away from a rolling maul shortly before halftime to take a 15-5 lead.The visitors from Ireland scored their third try out wide minutes into the second half for a 22-5 lead, but a determined charge from the Toyota Cheetahs in which Ox Nche, Joseph Dweba and Rhyno Smith scored within 12 minutes pushed them into a 26-22 lead going into the fourth quarter.Nche scored from strong forward play, while good line breaks and fantastic support play saw Dweba and Smith touch down. A subsequent try by Munster, who showed good patience on attack, and then added their second penalty goal minutes later nudged them into a four point lead with four minutes to go. The Free Staters then worked their way into a position to score in the dying minutes, but a knock-on dashed their hopes of a late victory. At the Madibaz Stadium, a late charge in the first half by Leinster, combined with the Isuzu Southern Kings’ poor discipline, which saw them receive five yellow cards, paved the way for a 38-31 defeat in a high-scoring game in extremely windy conditions. A total of 11 tries were scored in the encounter. The hosts struck first three minutes after the kick-off with a try by Yaw Penxe, but the visitors replied with two tries – one of which was a penalty try – to go 12-5 ahead. Things went awry for the Isuzu Southern Kings as they received four yellow cards in the next 15 minutes. But despite this they were able to score their second try compliments of an intercept by Stefan Ungerer seven minutes before the break to level the scores at 12-12.The yellow cards, however, took their toll in the dying minutes of the half as the Leinster touched down three times in four minutes to stretch their lead to 33-12 going into the break.Ungerer scored his second try three minutes into the second half, and after a competitive stretch in which neither team was able to score, Leinster added their sixth try minutes into the final quarter.The Isuzu Southern Kings fought until the end and the rewards followed, as Lupumlo Mguca and Dries Van Schalkwyk scored tries in the dying minutes to go down 38-31, despite receiving their fifth yellow card. In the other matches, Ospreys suffered a 20-29 home defeat against the Glasgow Warriors in Swansea, Edinburgh beat the Scarlets 31-21 at Murrayfield, Ulster registered a 15-10 win against Benetton in Treviso, Cardiff beat Zebre by 37-0 at home and Connacht defeated the Dragons 33-12 in Galway. Guinness PRO14 Round 8 results and scorers: Isuzu Southern Kings 31 (12) Leinster 38 (33) Isuzu Southern Kings – Tries: Stefan Ungerer (2), Yaw Penxe, Lupumlo Mguca, Dries Van Schalkwyk. Conversions: Masixole Banda (3). Leinster – Tries: Dan Leavy, Max Deegan, Jamison Gibson-Park, Adam Byrne, Bryan Byrne, Penalty Try. Conversions: Noel Reid (3). Toyota Cheetahs 26 (5) Munster 30 (15) Toyota Cheetahs – Tries: Joseph Dweba (2), Ox Nche, Rhyno Smith. Conversions: Tian Schoeman (3). Munster – Tries: Arno Botha, Kevin Obyrne, Liam Coombes, Mike Haley. Conversions: Bill Johnston (2). Penalty Goals: Bill Johnston, Rory Scannell.